"We need as many of you to participate as possible to make this a truly effective test." 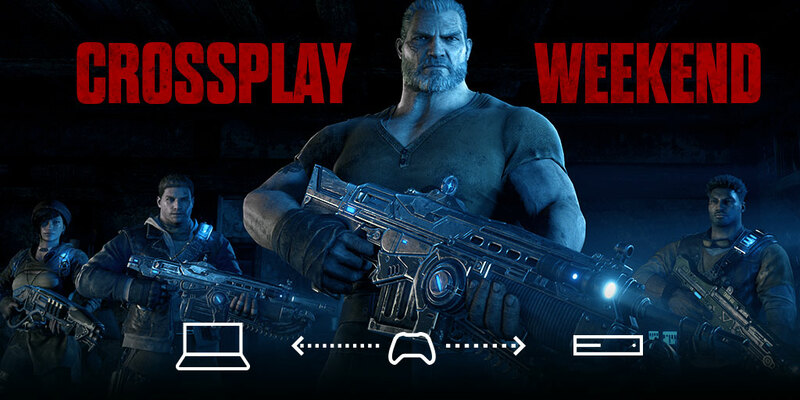 In a post on the official forums today, The Coalition announced plans to test PC/Xbox One competitive multiplayer cross-play for Gears of War 4. The test will kick off Friday, December 2, and will run through Monday, December 5, in an effort to "to evaluate the potential of a more permanent Crossplay solution in the future to allow Windows 10 and Xbox One gamers to play together in Versus outside of Private Matches." "We care deeply about players on both platforms and we've heard you, so our goal is to use this event to bring in a ton of data and listen to feedback from players on both platforms to examine the results," the post reads. "What comes next after this hasn't been decided - this weekend is an incredibly important first step in this process. Once we use the combination of our data and your feedback together, we'll be able to make an informed next step (or not as the case may be). The key thing we want to stress is that we won't be making any surprise changes all of a sudden based on this weekend." The test will focus on Team Deathmatch, Dodgeball, and King of the Hill modes, with all of the game's multiplayer maps available with a max squad size of five. Additionally, anyone who participates will see an increased bonus - 1500 for wins and 750 for losses. Man, hope this doesn't go the way of the old Shadowrun game where PC just curb stomps the console players. For that there would actually need to be PC players. I dont know if anything changed, but last i checked the UWP version had issues. Oh believe me, it will. You have better odds of meeting Elvis than a Gears 4 PC player. For what it's worth, the PC version runs amazing. I know the player count is very low though. Well I admire your tenacity for getting Windows 10, onto the Windows Store, through the updates, through the Xbox Live account process, the download, the log ins and then you actually got to play the game! If there's ever a real PC release I'll be sure to look for you online. I hear ya buddy. I waited until the 11th our to get a free upgrade to Win 10 and it's not too bad. I'm not thrilled about UWP and its fluff but at the end of the day it hasn't been too intrusive and it hasn't caused me any problems like some people have. I'm willing to work through some of the growing pains if it gets me Forza and Gears on my PC. What's 1 more launcher when we're already forced to deal with Uplay, Origin (which has improved), and Steam. Edit: I'm fully aware of the UWP/Microsoft closed platform worries and such but I honestly don't see UWP getting enough traction with the way its going to become any real threat. You can't even play with people outside of UWP on multiplat games like Call of Duty. I believe I read that article here on the Escapist. Bless em for testing it out, but i expect mouse users to have the kind of advantage console players don't want to see in a ranked mode, i'd understand if they wanted to disable mouse input in cross-player multiplayer.